The generic name Dermochelys was introduced by Blainville (1816). The specific name coriacea was first used by Vandelli (1761) and adopted by Linneaus (1766). The binomial refers to the distinctive leathery, scaleless skin of the adult turtle. The people of the Wider Caribbean know Dermochelys by a variety of common names, the most prevalent being leatherback in English, laud (or tora) in Spanish, and tortue luth in French. 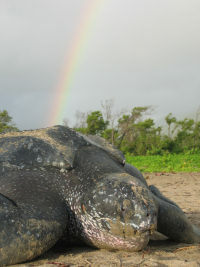 Largest of all turtles, adult males can exceed nine feet in length and weigh 2000 lb or more. Carapace color ranges from black to dark brown, often with pink, white or bluish splotches. The plastron is whitish, giving the animal a counter-shading effect. The carapace is elongated and has seven ridges running its entire length, with six longitudinal ridges found on the plastron. Scientists believe that these ridges improve laminar flow and promote swimming efficiency. The species is unique among sea turtles in lacking a hard shell. The carapace is composed of small osteodermic pieces (think “tiny little bones”) embedded in a thick matrix of cartilaginous dermal tissue; as such, there are no scutes present on the shell. 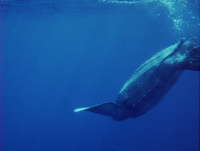 Adults lack head and flipper scales, and have no claws on their flippers. An unpigmented (pink) spot on the crown of the head – unique to each individual – may gauge day length and aid in migration. 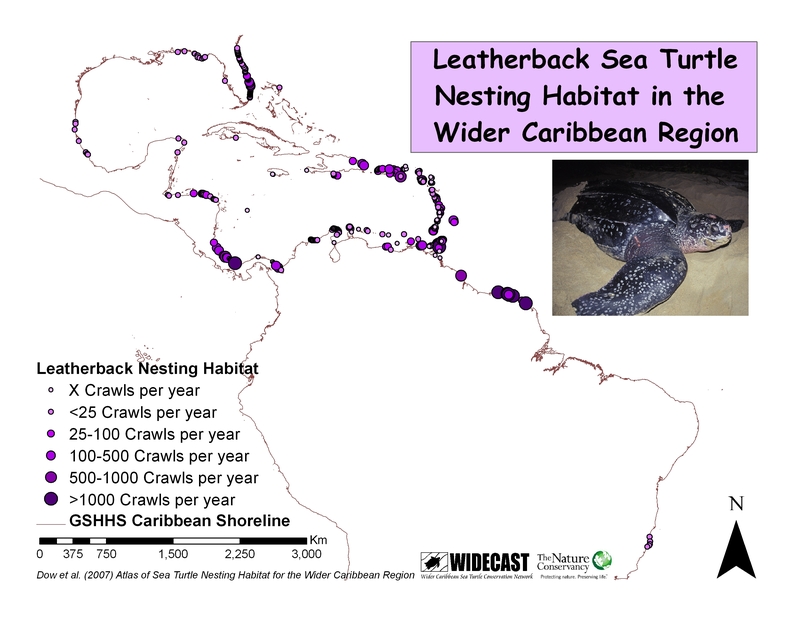 Nesting peaks between April and July in the southern Caribbean, home to the largest known nesting aggregations of leatherback turtles on earth. Nesting grounds tend to be located on beaches adjacent to deep water (offshore reefs can injure the soft-skinned turtles). Females migrate to mating and nesting grounds every two to three (or more) years, storing sperm throughout the nesting season and fertilizing as many as 12 clutches of eggs laid 9-10 days apart. Each nest contains an average of 70-90 large, yolked eggs in addition to a variable number of smaller, often misshapen yolkless eggs whose function has not been fully defined. During non-reproductive seasons, adults range widely in search of soft-bodied sea jellies and salps, using three interlocking cusps to slice into their prey. Famously deep diving to forage and to escape predators is enabled in part by a moderately flexible carapace and plastron, and the capacity of blood and muscle tissue to hold relatively high amounts of oxygen (rather than storing it in the lungs). 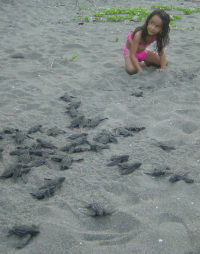 Hatchlings enter the sea and immediately head for the open sea, very little is known about juvenile stages. Wild growth rates and age at maturity are unknown. The species is solitary by habit, and perhaps the most migratory of all sea turtle species. Management is challenged by a landscape of genetically distinct but geographically overlapping populations. 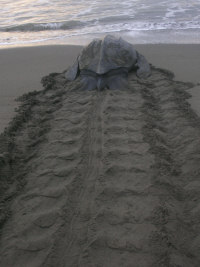 Leatherbacks are documented worldwide in all oceans, from Nova Scotia and Alaska south to South Africa and New Zealand. The most northern record is that of an adult female caught at Skreifjorden, Norway (ca. 71° N) in September 1997. Adults tolerate cold water due to a range of thermoregulatory adaptations, including counter-current heat exchange systems in the circulatory apparatus in their limbs, high oil content and large body size. Primarily pelagic in distribution, adults routinely migrate thousands of miles from highseas Atlantic foraging grounds to Caribbean nesting beaches. 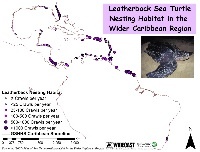 Many of the largest leatherback nesting colonies in the world are found in the Wider Caribbean Region. According to Dow et al. (2007), 10 colonies with more than 1,000 crawls per year are clustered in the southern sector of the region (Panama, Trinidad, Suriname, French Guiana). Four additional sites report between 500 and 1,000 crawls per year and are more broadly distributed, located in Costa Rica, Guyana, Suriname, and the US Virgin Islands. More than half (58 of all known nesting beaches support very small colonies, fewer than 25 crawls per year, and 21have unknown crawl abundances. Read “The Biology of Sea Turtles” Volumes I (1997) and II (2003), published by CRC Press (Boca Raton, Florida); “Voyage of the Turtle” (2006) by Carl Safina, published by Henry Holt and Company; and “Sea Turtles: An Ecological Guide” by D. Gulko and K.L. Eckert, published by Mutual Publishing (Honolulu, Hawai’i) in 2004. Working together to realize a future where all inhabitants of the Wider Caribbean Region, human and sea turtle alike, can live together in balance.